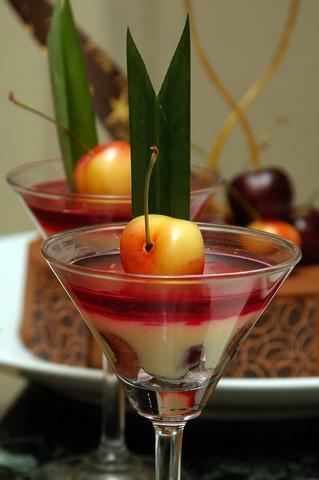 Many Malaysians balk at the mere mention of cherries because they mistook the flaming red maraschino or glaced cherries for the real thing. I can assure you fresh cherries taste nothing like the ones preserved in the bitter-sweet liqueur. Instead, they are plump, juicy and delightfully sweet - one of the best summer fruits that we are now lucky enough to savour with the advent of modern-day logistics. My girlfriend who reps for the Washington State Agricultural Marketing Board, often clues me in on when the cherry season arrives and this year, she even asked if I'd like to buy a box of fresh cherries for my own enjoyment. Despite the rather steep price, I was not to be deterred and agreed immediately to order a box. These diamond of fruits are worth every single sen I paid for them. Of course, I was unable to gorge a 9kg box of cherries in a sitting so I played fairy godmother and distributed the lovely fruits around to family and friends. The Bing cherries with their shiny, mahogany skin and lightly tart sweetness were just too good for words. They turned out to be more sturdy despite my not-so-careful handling so they lasted a wee bit longer than the delicate Rainier cherries. Of the two, the latter was sweeter with a delicate crunch. But they bruise easily and ripen incredibly quickly so we really had to raced against time to finish the whole lot! 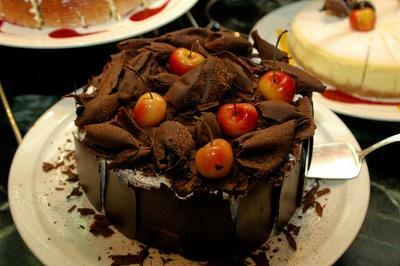 Sweet cherries were first discovered in Asia Minor (present day Turkey). Dispersed throughout prehistoric Europe, cherries were brought to America by ship in 1629 and modern sweet cherry growing began in the Northwest of the United States of America when Henderson Lewelling transported nursery stock from Iowa to Western Oregon. Did you know that the ‘Bing’ variety was named after one of Lewelling's Chinese workmen? It was on this farm that the cherry tree was first developed from seeds in 1875. It takes a new tree nearly 10 years to reach maturity. The crop volume and quality are susceptible to many factors – fluctuating temperatures are a constant threat. New buds form on the tree following harvest and remain dormant for the next season. Frost is hazardous to these delicate buds and if the temperature drops to ‘bud-kill threshold’, cherry growers have to use wind machines, orchard heaters and overhead sprinklers to ‘warm’ bud temperatures. Each spring, thousands of bees are specially brought in by the cherry growers to their orchards to ensure the cherry blossoms are pollinated or else the blooms will not turn into fruits. It generally takes about 65 days to grow the Northwest Cherries to full maturity. At harvesting stage, rain can be a real nightmare as temperature, wind speed, amount and duration of rainfall can cause the cherries to absorb too much water and burst! To minimize damage, the cherry growers will rely on wind machines to dry the cherry trees. Some orchard owners even go to the extent of hiring helicopters to hover at specific heights to blow the rain water off the fruits! The cherries are allowed to ripen completely on the trees before they are handpicked at the peak of their freshness and flavour. Harvesting usually occurs between mid-June and mid-August. Since the fruits are highly perishable, the cherries are manually collected in shallow bins to minimize bruising and kept covered to prevent the stems from drying. The cherries are then ‘hydrocooled’ – a practice that douses the cherries with ice-cold water when they arrive at the packing house and as they move through packing lines. Industry-developed tools for measuring cherry firmness and sugar content help ensure quality before the cherries are packed in sturdy cardboard boxes with polyliners to maintain a high humidity level and a low level of oxygen surrounding the fruit. The golden-skinned ‘Rainier’ cherries with pinkish-red blush which come from the crossing of two dark sweet varieties, the ‘Bing’ and the ‘Van’, are especially fragile, requiring ten times the labour per acre to harvest compared to dark cherries. Unlike the dark sweet cherries that need only harvesting once, the ‘Rainier’ cherry tree may be harvested as many as eight times as the delicate cherries do not ripen uniformly. They also require specially designed, foam-lined picking containers to hold the fruits to reduce impact and handling, thus maintaining their fine texture, clear-coloured flesh and delicate, sweet flavour. A good source of fibre, Vitamin C and essential minerals such as calcium and potassium, cherries are low in calories and fat. They are also sodium- and cholesterol-free and relatively high in anthocyanins, a family of antioxidants that have the ability to reduce the risk of cardiovascular disease. 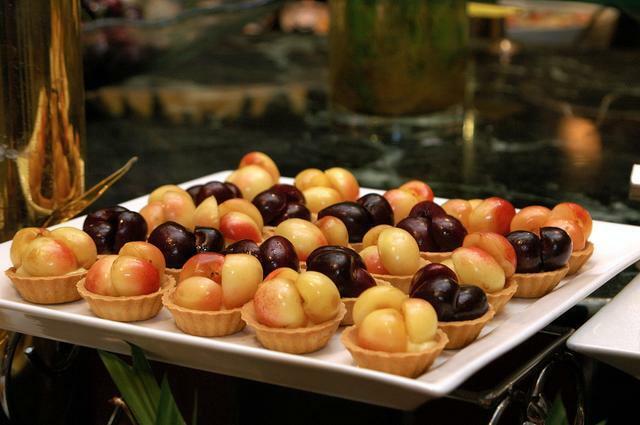 Although nothing beats the wonderful taste of fresh cherries, these delightful fruits are remarkably versatile and can be used for a wide variety of desserts. 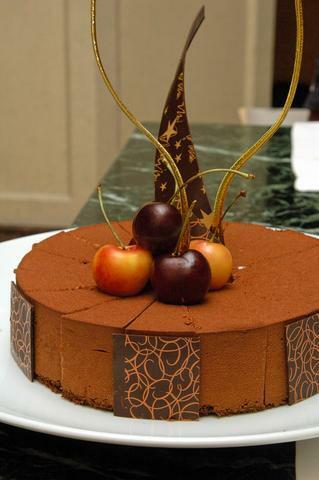 Some of the cherry desserts that we have sampled at the Sheraton Imperial KL included cherry blackforest cake, cherry trifle, cherry butter cake, cherry cheesecake, cherry crumble, cherry mousse, cherry rice pudding, cherry roulade, walnut cherry cake, cherry tartlets, cherry clafoutis, cherry crêpes and cherry cheese strudel amongst others. The cherry blackforest cake is top notch – the dark, rich chocolate cake is the perfect foil for the Bing cherries. 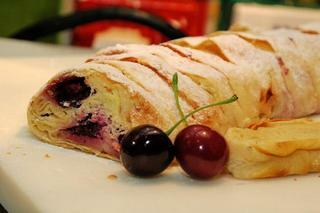 Quite similar to this is the cherry roulade, miniature chocolate Swiss rolls of cream and cherry halves. We also liked the cherry strudel with its layers of light, airy puff pastry filled with creamy ricotta cheese, mildly sweet custard and cherry halves. Don’t make the mistake of eating the cherry butter cake on its own. It can be rather dry and unimpressive of its own. Add a scoop of vanilla ice-cream to it and you'd be amazed how fabulous it can taste! Ever had a cherry brûlée before? If not, you must try this luscious dessert that has fresh, plump cherries and ricotta cheese in it. 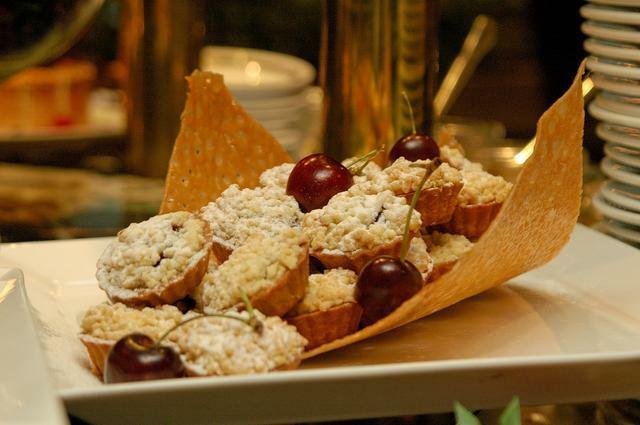 Another outstanding creation is the walnut cherry cake that combined the fabulous Rainier cherries with the distinctive flavour of chopped walnuts. Besides these desserts, you can enjoy fresh cherries with ice-cream and yoghurt, or blend them with milk and cream to make cherry ice-cream, or use them in your favourite salads. There is really no limit to what you can do with these splendid fruits. If you like more information on cherries or tips and recipes, visit www.nwcherries.com. Cherry-o everyone!